I’m staying in an apartment in Paris for the next few days after presenting a paper at the XXIV International James Joyce Symposium at Utrecht University in the Netherlands. I’ve written about the conference here, and I’m moving on to more important sustainability issues than the pettiness of academic arrogance. I’m here in Paris today in a wonderful residential area fairly close to the Louvre-there are tons of kids around-and, I’m thinking back about the Netherlands, too. These are places that have evolved into natural places of conservation in terms of energy and food, and in building into their daily life systems patterns of behavior, such as walking and bicycling, that keep people healthy. They have and will fight against irresponsible, immoral corporations and their supporters among craven political leaders. I’m reminded of all this in particular because of the 4.1 earthquake that struck the Oklahoma City area this week as I was in Europe. As I’ve written over and over, this bizarre, incredible earthquake surge in the state, according to scientists, is related to the oil and gas drilling process known as hydraulic fracturing or fracking. Here’s the bottom line. Your life is in danger. Your home, if you own one in central Oklahoma, is probably getting damaged on daily basis. Your home’s foundation is probably cracking. The larger trees on your property could come tumbling down when the big one hits. Your roof could be damaged. Your window sealing might have to be redone. Think about your house, right now, at absolutely zero monetary value. That is what could be coming your way, and maybe it won’t matter because you’ll be dead, anyway. That’s the Oklahoma spirit, right? Oh, and the qualifications by the oil and gas industry here are so incredibly and obviously acts of rhetorical subterfuge and secrecy that one wonders how people in Oklahoma even survive in the modern world because of their failure to call it out. The qualifications from the billionaire oil men’s club: Well, it’s never been proven conclusively that fracking here causes earthquakes and, well, it’s the wastewater injection wells actually that are used in the fracking process that maybe just maybe might cause this minor problem so then is it really fracking causing the problem? I repeat: State political leaders, such as Gov. Mary Fallin, who could do something about this problem are not going to do a thing about stopping the looming earthquake disaster because they are beholden to the oil and gas industry for campaign contributions and electoral support. Here from Europe, I noted the recent earthquake shook up the metro Oklahoma City area as well, this time, not just places north of Edmond or Jones or Spencer. It would not surprised me a bit if down the road, unless more intelligent people are given a voice in this debate, that the buildings on the Chesapeake Energy “campus,” as if it’s a university with thoughtful people trying to seek truth and use deep critical inquiry to solve major contemporary problems, will come falling down like dominoes, one temblor after another. It won’t even be poetic justice, just another act of willful ignorance based on greed. 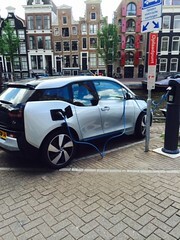 I passed a small, parked electric car fueling up in Amsterdam, Netherlands the other day, and it’s the future of the world. (Note the photograph above.) I know much of the U.S. and Oklahoma face the problem of urban sprawl. Just because people weren’t foresighted enough about the car and fossil fuels in this country several decades ago doesn’t mean we can get there now. Europe was forced into their situation, sure, but they have the answer, not American oil and gas companies. Renewable energy sources are the answer to our earthquake problem in Oklahoma. « "Is a US-Iranian Alliance Possible?"